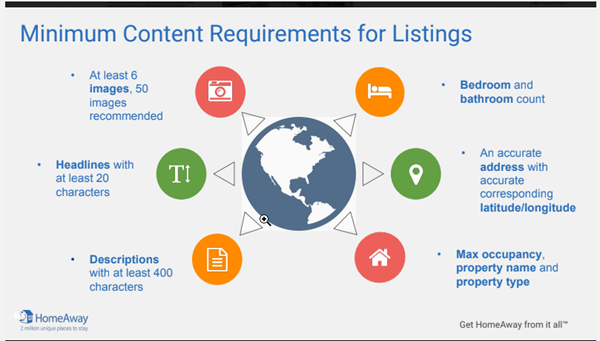 For the soon to be released HomeAway direct connection, you need to make sure you have the minimum content requirements loaded In ResOnline in order to proceed with the mapping once this connection is released. Minimum Content Requirements for HomeAway! Registration Number – The Registration Number must be specified to HomeAway;( if the property's jurisdiction requires registration). Rental Agreenment PDF – Upload a PDF under ResOnline Property Details - Booking Policies to send HomeAway. (This covers the rental rules and policies to the guest). Please ensure that you have minimum content entered into all your listings that are in ResOnline. ResOnline will let you know via email, once this connection is ready to go live!